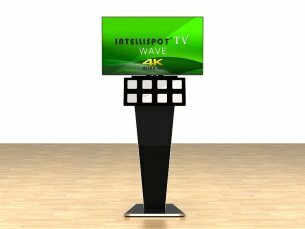 WAVE – Wave is a new innovative way to attract audiences. It is a combination of a LED screen and 8 control buttons. Each button is associated with a video file stored on a flash memory connected to the LED screen. Touching or waving the hand above the buttons will load and display the associated video automatically. When the video displaying is completed wave will load the main video and display it repeatedly until a button is interacted. With state of the art technology no computers or external devices are required. Just insert your Flash memory and start the show. Easy, innovative and cost-efficient. Thanks to Wave technology the buttons can be placed behind any material such as, glass, fabric, wood etc. The interaction is still there creating Jaw-dropping effect. Wave applies to wide range of business field such as exhibitions, banks, hotels, restaurants, travel agencies etc. In fact the list is endless of ideas of using wave to display products and services and attract all kind of audiences and customers. For more information please contact us at your convenience. Copyright © 2018 Intellispot GmbH. all right reserved.